Drawing inspiration from the classic polo shirt, the long sleeve merino polo will lend sophistication to any outfit. 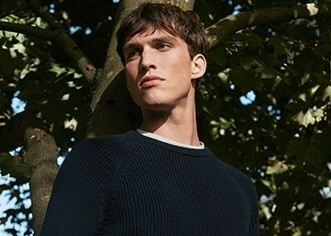 Crafted in a lighter, 27 gauge wool on traditional frame knitting Bentley Machines, this merino jumper is the perfect layering option for all year round. It features a 3-button fastening with natural horn buttons, ribbed hems and cuffs, and a crisp collar.